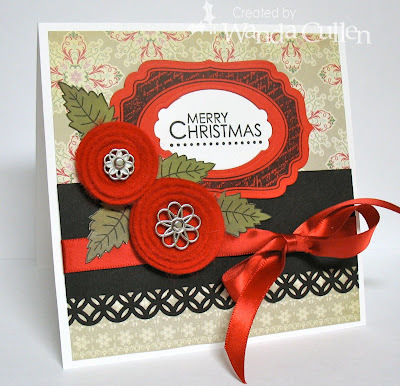 The featured stamper on SCS is Cheryl (cherylquilts) and she has a gallery full of beautiful cards! I chose this card to CASE & chenged the image, border punch, & Nesties, but kept the same colors and sketch. No, he's not a relative of Charlie Sheen - lol! Our Daily Bread's Shining Light Challenge was to choose a top 3 challenge and I chose SPARKLE, though you'd never know it by my photo. I sprayed the oval with Glimmer Mist and there are 3 black rhinestones and nothing looks sparkly in the pic. :-( Trust me...it's there. 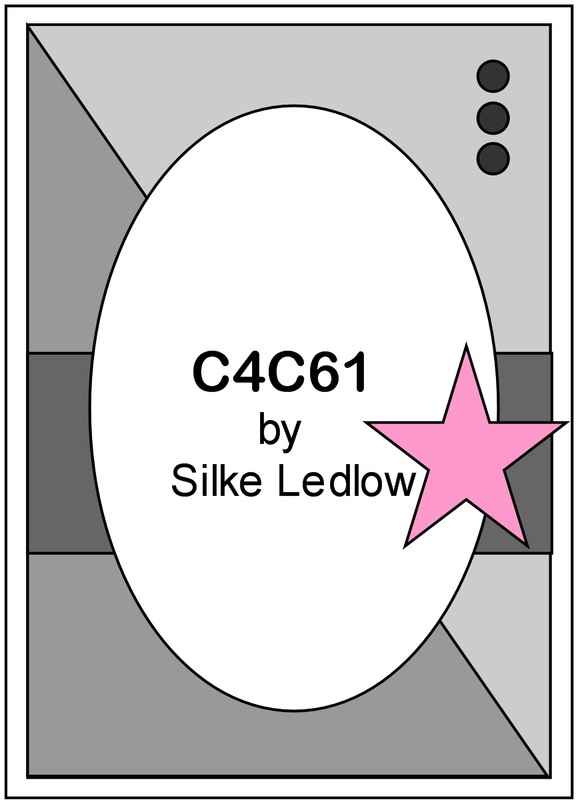 I also played along with Crazy 4 Challenges where Silke hosted a great sketch for us. I used the ends of a Labels Ten die cut on black to add just a few 'scallopy' (new word?) details. I'm off to get ready for work this afternoon. The students are having a Halloween dance, so this gives me an opportunity to dress up. Have to keep it fairly simple, so think my witch's hat and cape will be coming out of the attic. Have a great w/e everyone! 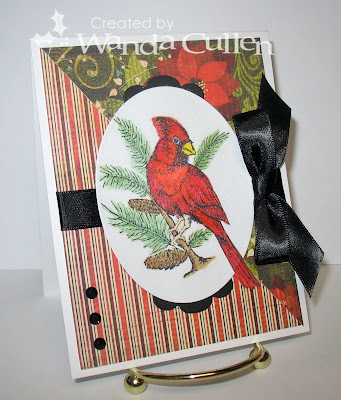 I definitely have a significant pile of scraps to use up, so this bird punch was the perfect solution to use. 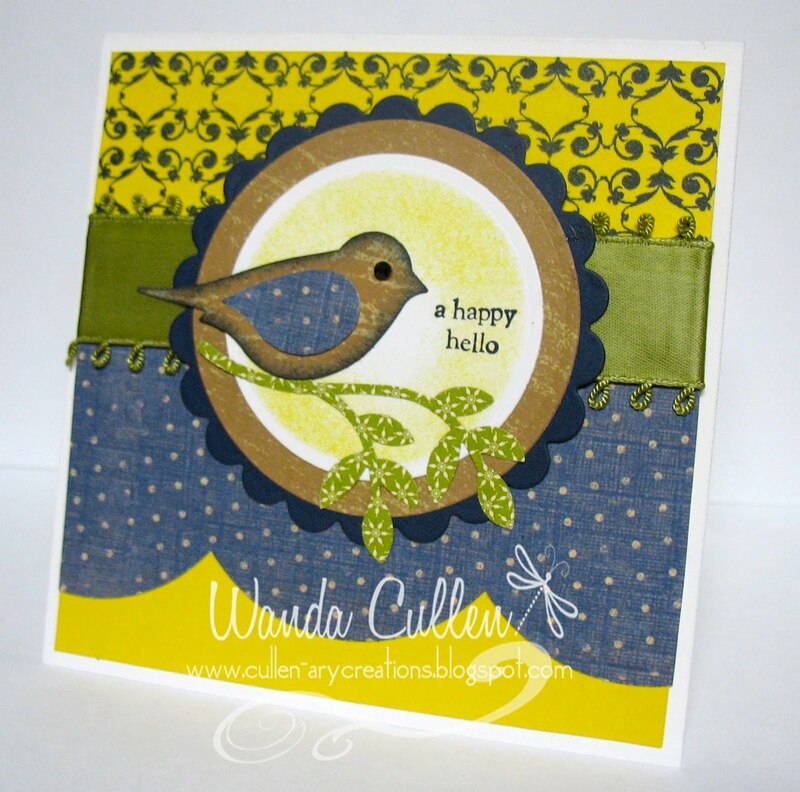 I CASED Cathy's card by using the bird theme, keeping it a square card but tweaking her layout a bit. 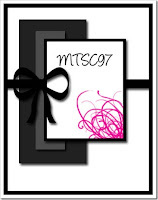 Julia's Ways to Use It Challenge on SCS was to use a frame on a card. 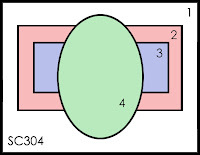 I immediately went to Claire's Waltzingmouse Stamp set that coordinates with the Labels Four Nestabilities dies. 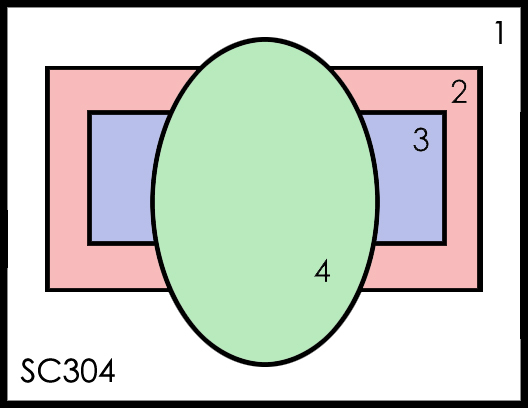 The center was die cut with a Labels Ten die. The rolled flowers were created using a die on Pure Poppy felt from PTI. I waited over an hour for the glue to dry and it STILL wants to show behind the one brad! :-( Another Christmas card done for the year. 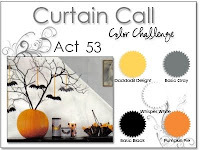 Korin had a great Sketch Challenge on SCS which I combined with the Color Throwdown Challenge. I used Old Olive instead of Certainly Celery and used Cherry Cobbler instead of Riding Hood Red...my ulterior motive was to use some new DP from SU. :-) I used a stamp and matching die from PTI for the focal point, and added a Copic-colored image that was cut out and layered with dimensionals. Thanks for stopping by...and don't forget to leave a comment. I love hearing from all of you! Joanne has a fabulous Color Challenge on SCS this week: Baja Breeze, Blushing Bride, & Crumb Cake with a dessert option to use pearls and/or lace. 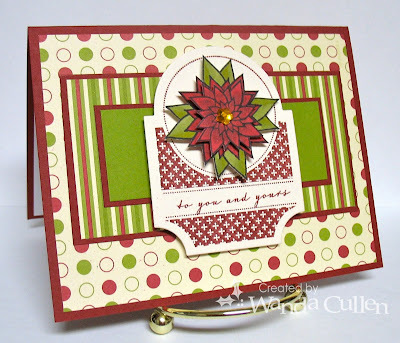 I used Mercy's Tuesday Sketch Challenge for the layout and had fun layering these gorgeous Verve flowers. 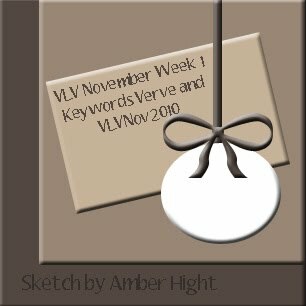 Julee has another great Mojo Monday Sketch Challenge on board and I decided to keep it plain and simple. I had never inked up this little Verve wreath before and wanted it to be the focal point. I added some Dazzling Diamonds glitter to it and paper-pieced the ribbon. Another Christmas card down...many more to go. OK...so I challenged myself to use the Our Creative Corner Challenge colors of Certainly Celery, Pumpkin Pie, Rich Razzleberry, Early Espresso & White to make a CHRISTMAS card! Yikes! What was I thinking? 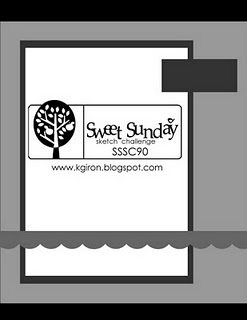 I went with Karen Giron's Sweet Sunday Sketch Challenge for the layout. I'm still kinda cringing when I look at it...VERY definitely non-traditional and different. The jury is still out on whether it gets sent to anyone - lol! Stacey's Curtain Call Color Challenge this week was to use Daffodil Delight, Basic Gray, Pumpkin Pie, Black & White. I colored the image - another new one from the York stamp show - with copics and kept the layout very simple. I hate to see this gorgeous fall w/e come to an end, but it was great while it lasted! ODBD's Shining Light Challenge was to use kraft, black and one other color. 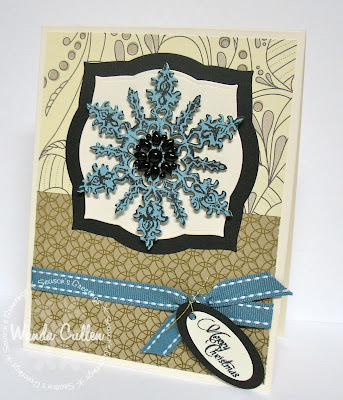 I combined this with Jen's SFYTT sketch and used a new snowflake stamp w/die to match that I purchased at the ODBD booth at the York stamp show. I sprayed the image with Glimmer mist and popped it with dimensionals. 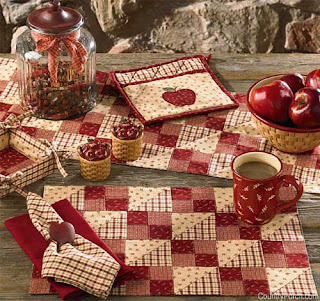 It's a gorgeous fall day in VA and I need to get out of my stamp room and into my laundry room. 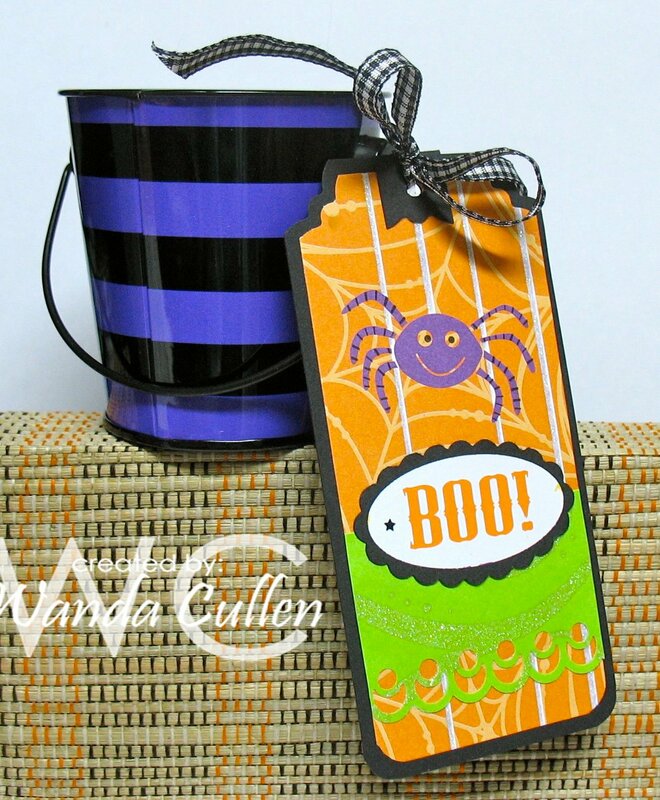 I found these cute metal pails in the Target dollar bin - 2/$1 - and thought they would make treat giving fun with co-workers. I created a tag from DP (no stamping involved) and attached it with gingham ribbon! Easy peasy! This is for Crazy 4 Challenges to make a Halloween card or project. This card catches me up on the October Viva la Verve challenges! Amber provided a sketch and we were to be inspired about anything during this season. The evening news predicted frost tonight...maybe not in the form of snowflakes (at least I hope not! ), but I thought the sentiment was appropriate anyway. 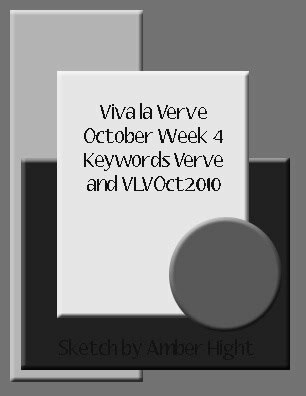 Amber's Viva la Verve challenge for week 3 was to CASE a card from Jackie Pedro's awesome gallery - to honor her induction into the Dirt Pile. 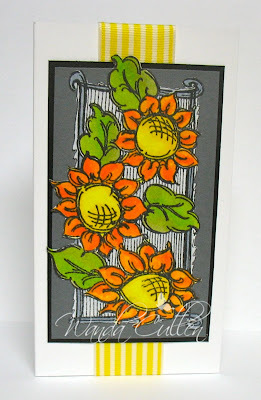 I love Jackie's style and have faved many of her cards over the years! She is the one who hooked me on using a corner chomper, so of course, I had to make a card that included that detail. 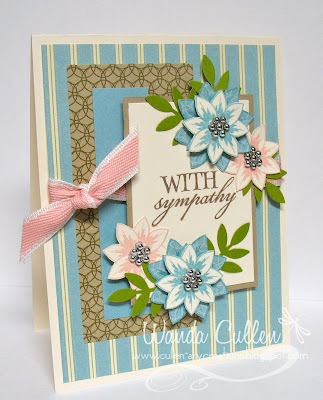 I cased THIS CARD of Jackie's and changed colors, omitted embossing & switched the border to the top. 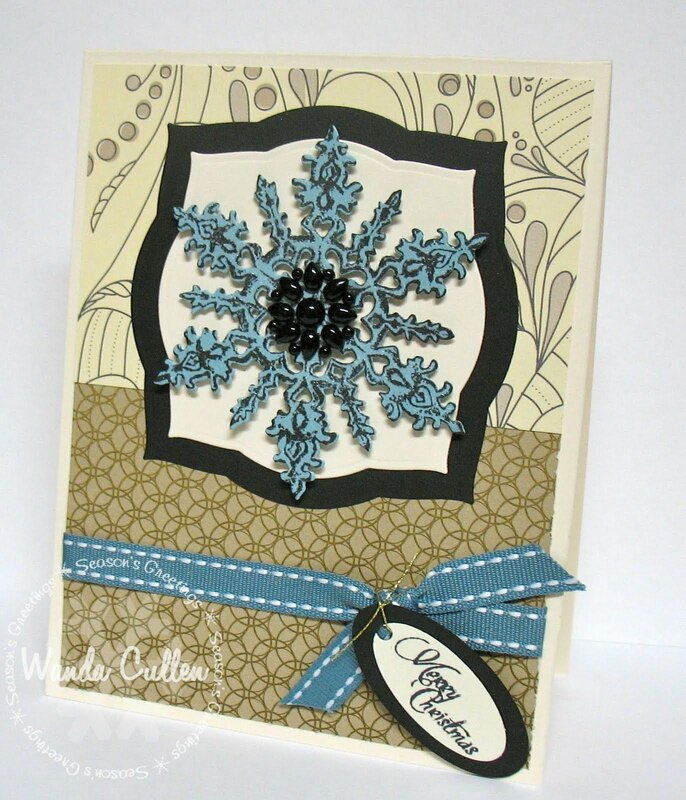 I colored the image with Copics and layered it over a punched snowflake. Today's Free 4 All Challenge on SCS is to create a card with some kind of flap on it. 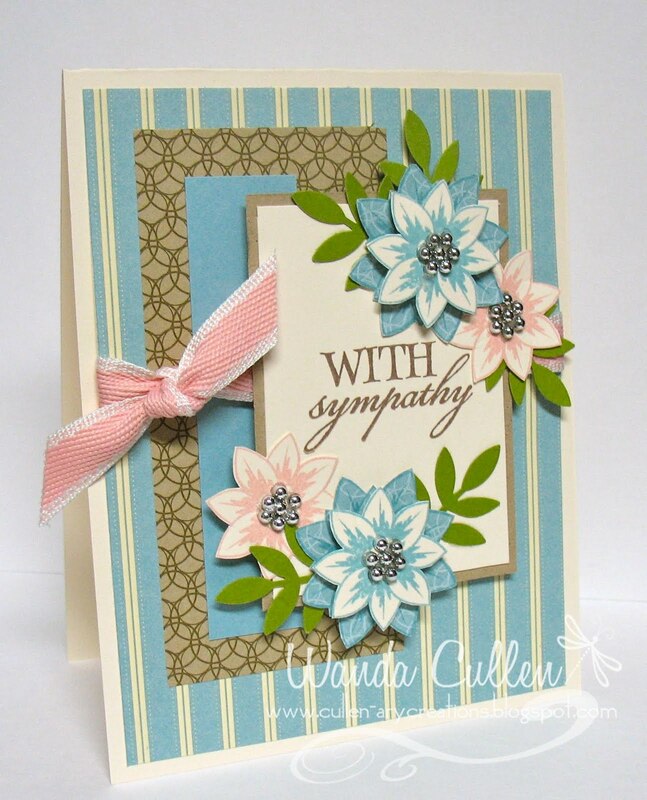 I layered white on New Leaf CS for the base then created a smaller flap card for the top. 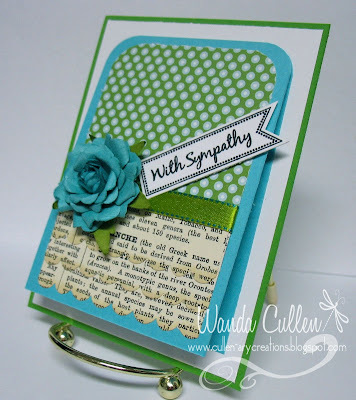 I was originally inspired by the colors and the layered script papers on a card created by Dawn McVey, a designer for Papertrey Ink. I was unable to find the link to her card, but did want to give her credit for my CASE. I sponged the scalloped edges using Antique Linen distress ink. 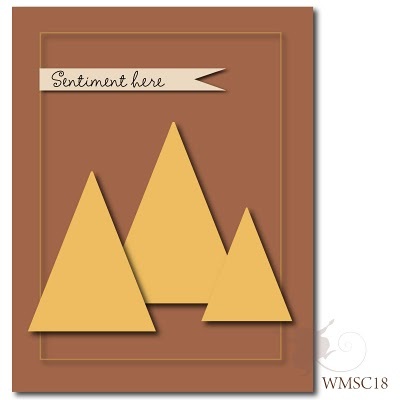 The sentiment tag is new from Lil Inker Designs...isn't it just the cutest?! 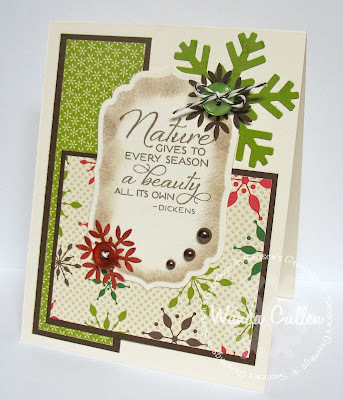 Laura Pryor has designed a variety of tag outline stamps with a variety of sentiments that fit inside. There is an accompanying die with the set, although I cheated and cut my tag by hand this time. I had some difficulty finding my mojo after a tumultuous week and a half of traveling to Ohio following my mother's massive stroke, visiting her in Cleveland Clinic while she survived briefly on a ventilator, then the family decision to stop life support and finally...her trip into eternity. It was a difficult yet peaceful transition thanks to the outpouring of prayers and love from family and friends. 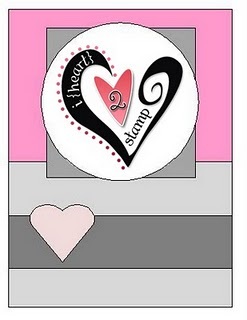 I'm ready to get back to some normalcy in my life and that means getting into my stamp room. 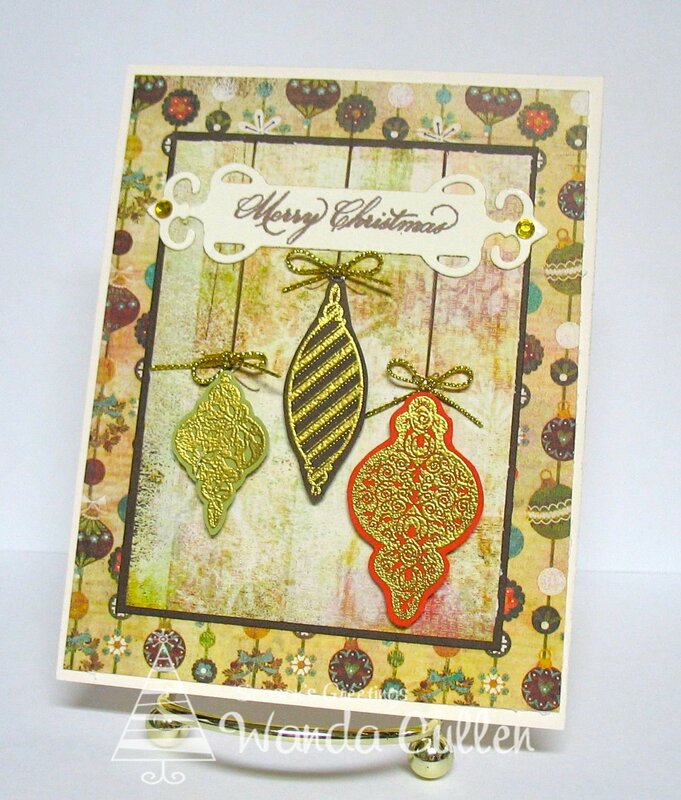 I used the Mojo Monday sketch with the Color Throwdown Challenge for my card. 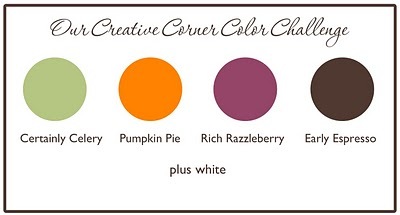 I struggled with the plum color, but that's why they call them challenges! I added some green stickles to the pumpkin leaves and for some reason, they don't want to show up well. I used YR18 Copic marker to highlight the pumpkins. 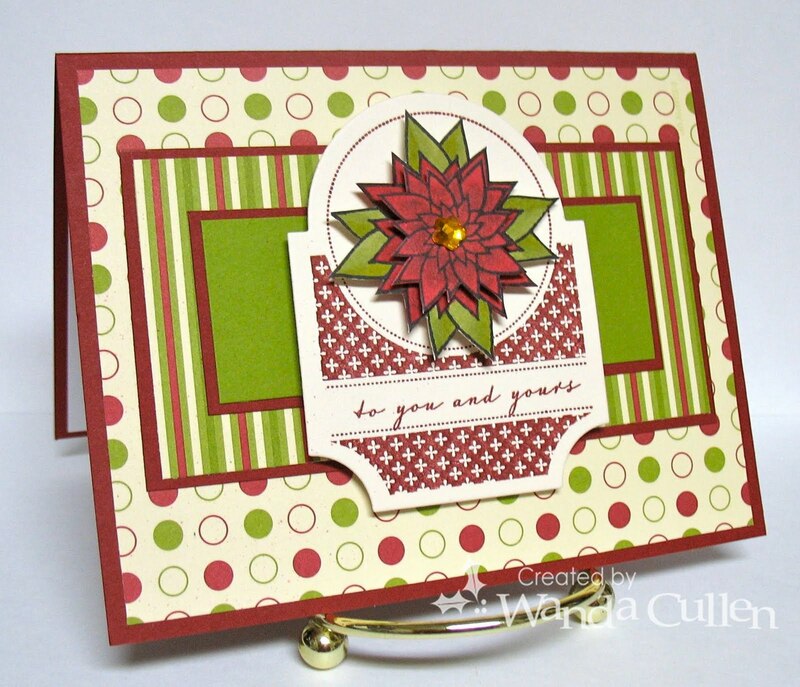 This card uses the layout for the Waltzingmouse Sketch Challenge and the colors for the Color Throwdown Challenge (Poppy Red, Chocolate Chip, Pear Pizzazz, So Saffron). 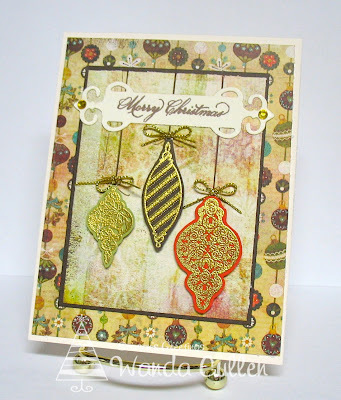 I gold embossed the ornaments, cut them out and popped them with dimensionals. I added some saffron rhinestones and little gold cording bows...quick and easy!